That is an apt description of the tradition of English-style bellringing, which began around 1600 and thrives today in thousands of towers worldwide. Living Heritage is also the title of the new book on the history of ringing here at All Saints Wokingham. 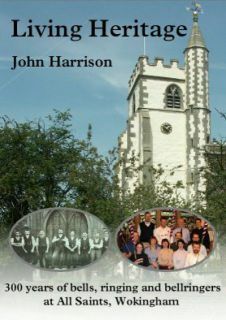 The motivation for the book came out of the tower tours and talks about ringing to community groups that began with Celebrating Community, when the bells were being restored in 2004. I was always impressed by how interested people were when they discovered just how much there was to ringing, so when someone suggested that I should write an article about the history of ringing in Wokingham, it seemed a good idea. Like all good ideas, it escalated. When research answered one question, it often threw up another one. Some sources were fortuitous, like receiving e-mail from ringers in former times, whom I had never met. Some sources were voluminous (imaging turning the pages of every Parish Magazine since 1865). Some sources were frustrating, like the virtually illegible 16th century documents I went to see in The National Archives. But after 5 years of research and writing, the book finally emerged. It is much bigger than ‘an article’, at 160 pages. The main part of the book has a 300 year timespan – the age of our oldest bells (installed in 1704). It follows the fortunes of the ringers from the 18th century when ringing was a public sport, through Victorian reform of both the church and ringers, through the boost to ringing when the bells were augmented to eight, through the trials of two world wars, and into the modern era. It lifts the lid on otherwise hidden aspects of the world of the people at All Saints who kept alive and developed this ancient art, many of them also making contributions to the wider world of ringing. The book looks at the times the ringers lived in, and how they related to both the community around them, and to the church whose bells they rang.